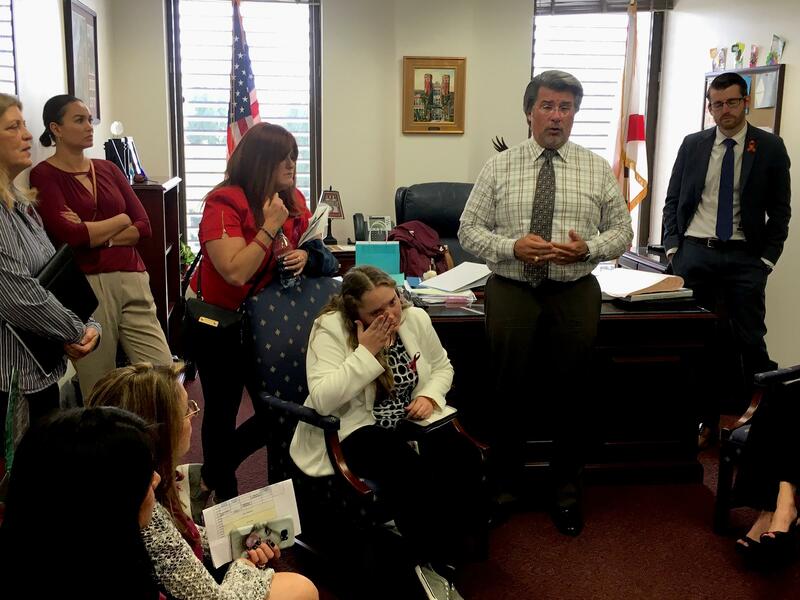 Elyse Claprood stands behind a chair where her daughter, Annabel, who is a Marjory Stoneman Douglas High School sophomore, is sitting, in the office of state Sen. Gary Farmer. 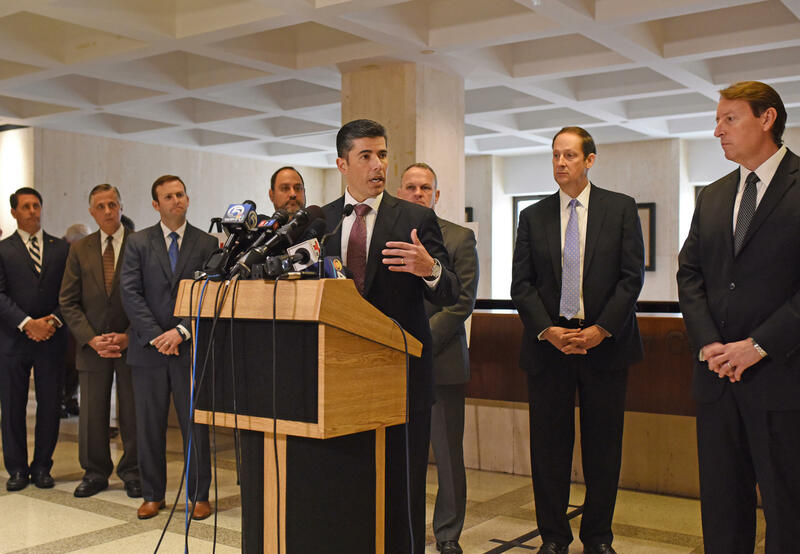 They visited Tallahassee to lobby for school safety reforms. They wanted state lawmakers to know: Annabel — she goes by Annie — has a right to feel safe at school. As the 16-year-old put it: she has a right to life. They left 12 hours later, still hopeful, but also confused and upset by a legislative process that felt dizzying, and a political climate that seemed to them more conducive to underhandedness and manipulation than the creation of meaningful policy aimed at preventing a future tragedy. Student survivors of the Feb. 14 massacre, their parents, and the families of the 17 people who died are taking advantage of a rare — and potentially fleeting — moment in which their voices carry a lot of weight in the state Legislature. But with that responsibility has come an up-close look at Florida politics. Some are not impressed. 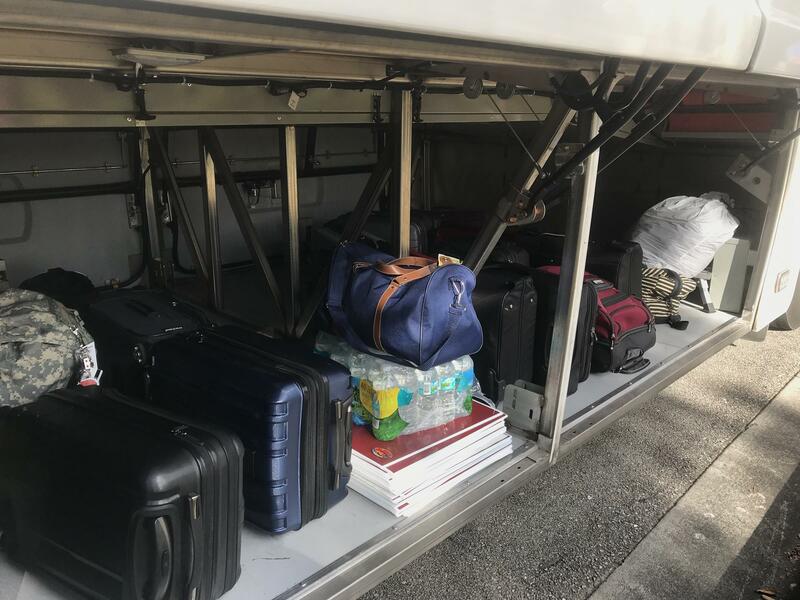 Elyse and Annie arrived in Tallahassee last Monday night, after a daylong bus ride with about 50 other Parkland parents, kids and local officials. Their whirlwind lobby day would start early on Tuesday. The mother and daughter agreed to let me shadow them for the day, so I could see what advocating for change during the stressful, painful time was like from their perspective. 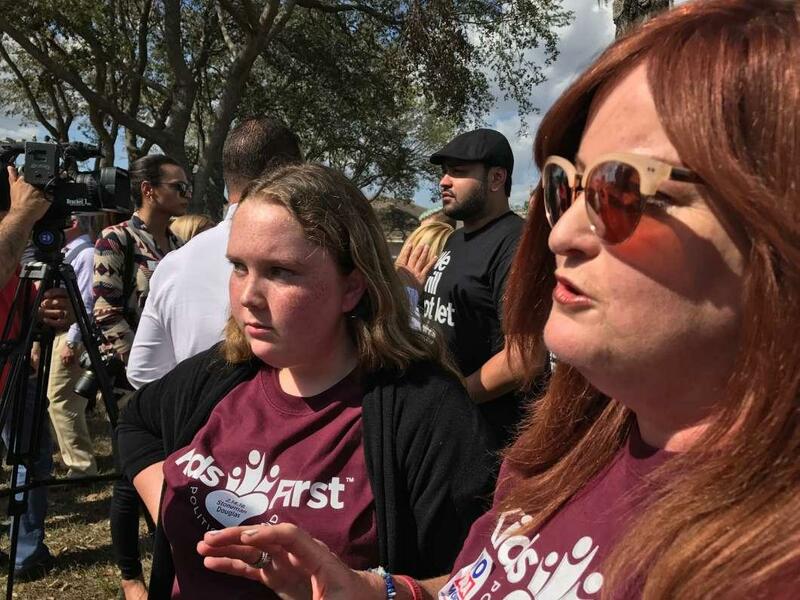 A group of about 50 Parkland and Coral Springs parents and students — including Elyse and Annabel Claprood — packed a charter bus last Monday, headed to Tallahassee to meet with lawmakers on gun control policies. When they got to the Capitol the next day, their first stop was the House appropriations committee at 9 a.m. 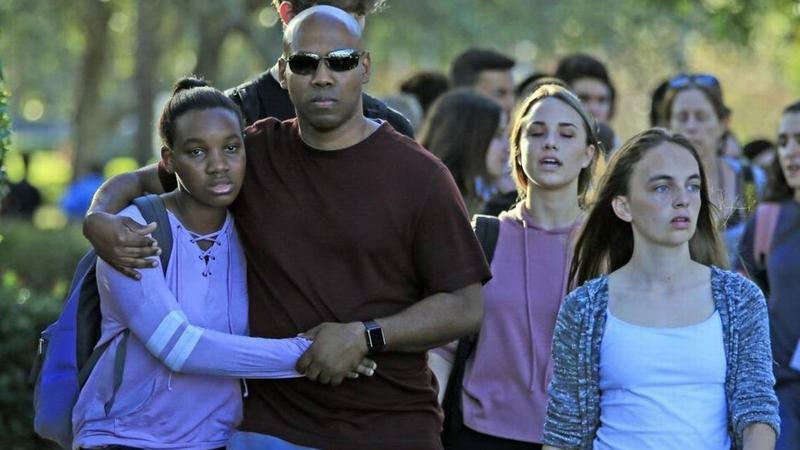 Chair Carlos Trujillo, a Republican from Miami, announced that anyone personally affected by the Parkland shooting would get to speak as often as they wanted and for as long as they wanted. Others were expected to keep their comments brief, or better yet, waive their time at the podium. His proclamation was unusual, but so were the circumstances. Sitting in the audience were parents of some of the shooting victims: Linda Schulman, whose son, Scott Beigel, was a geography teacher and died letting students into his classroom so he could shelter them from the shooter; and Andrew Pollack and Max Schachter, whose kids, Meadow and Alex, were gunned down at their school. Elyse sat on the end of an aisle, because she planned to duck out after about 20 minutes for a meeting with the governor. I sat between Annie and Patti Kodish, who is both a parent of Stoneman Douglas students and a substitute teacher who was there the day of the shooting, not even two weeks before. They were trying to fill out appearance cards, which they would then hand up to committee staff and wait to be called for their turn to speak on a comprehensive gun safety package that was crafted in response to the shooting. Among other provisions aimed at helping the Broward County high school recover and improving mental health services at schools statewide, the bill includes restrictions on gun purchases. It would raise the age for buying guns from 18 to 21 and implement a three-day waiting period. It’s almost unheard of for such a bill to have gotten as far as it has in the Republican-led Legislature — particularly in the staunchly conservative House. The parents from blue Broward County knew that’s what they were facing. Rep. Carlos Trujillo, left, chairs the House appropriations committee. He's shown here with his Senate counterpart, Rob Bradley. But as the meeting was just beginning, they were already confused. What was the bill number? I looked it up for them. Technically it had not yet been introduced as a House bill. So for the time being, the bill was called “PCB APC 18-06.” They were skeptical but trusted me and wrote down the chain of letters and numbers. Elyse was about to leave for her meeting with Gov. Rick Scott, which reporters were not allowed to attend. She texted me to ask if I could help Annie figure out when it was her turn to speak. I responded that I would. She quickly returned. The meeting with Scott was later than she’d thought. Before they could speak on the whole bill, they had to wait for the committee to wade through 17 proposed amendments that had popped up the night before. They were mostly changes proposed by the Democratic minority — almost certain to be voted down. One was a proposed ban on the sale or transfer of some assault rifles. A clergy member delivered a letter to lawmakers from other religious leaders imploring them to vote yes. He asked the committee how many of them had seen someone die from an AR-15 gunshot. That's the weapon used in the Stoneman Douglas shooting. At his words, Elyse buried her head in her hands, and when she looked up, her eyes were red and wet. Rep. Carlos Guillermo Smith made the case for the assault weapons ban. He represents Orlando, is gay and has worked as a gay-rights activist. He recalled the shooting that left 49 dead at the gay nightclub Pulse in June 2016 and said he knows the painful recovery Parkland is facing. He has seen what it’s been like for the gay community in Orlando. At 10:45 a.m., the group was supposed to leave to head to a meeting with a Republican senator who chairs the education committee. But Annie hadn’t gotten a chance to speak yet. She and Kodish decided to stay. Annie said she was getting impatient but was still eager to speak. She said she wanted the committee to feel “guilty” if they didn't approve the bill. Eventually, Annie grew bored, and she was on her phone, toggling back and forth between internet memes, texts with her mom and a separate thread with a CNN reporter. She asked if I use Twitter, then took my phone and followed herself from my account. In her picture, she’s flashing a huge smile. She said it’s from three years ago — she was 13 then. In one of her most recent tweets, she marveled over meeting Emma González, a Stoneman Douglas senior who became a national icon for gun control after delivering a viral speech at a rally in Fort Lauderdale a few days after the shooting. The committee allowed some of the Parkland parents to speak out of turn because they had to leave. 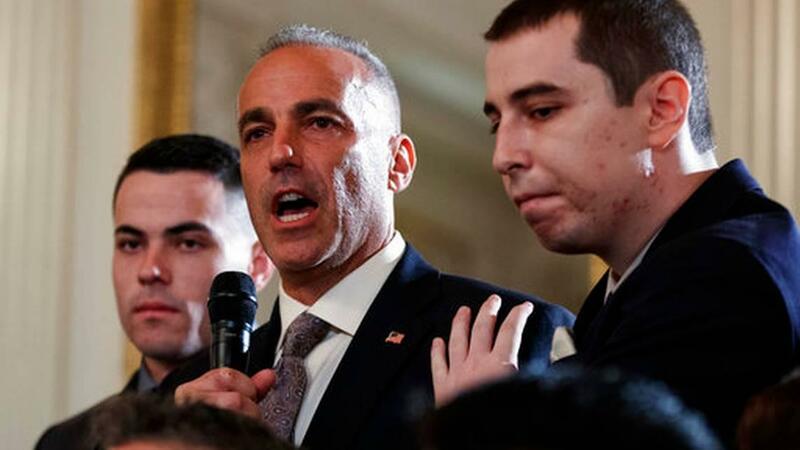 Andrew Pollack, center, speaks at a White House event about his daughter, Meadow, who died in the Parkland shooting. 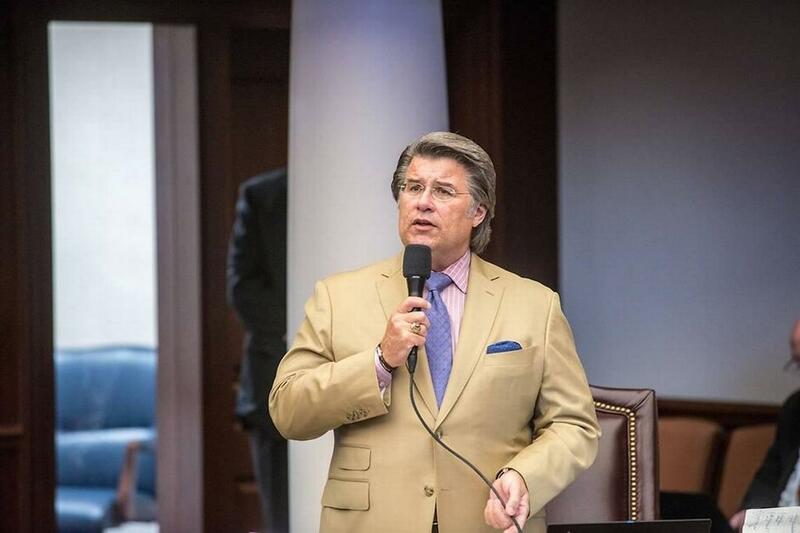 He also addressed the House appropriations committee in Tallahassee last week. 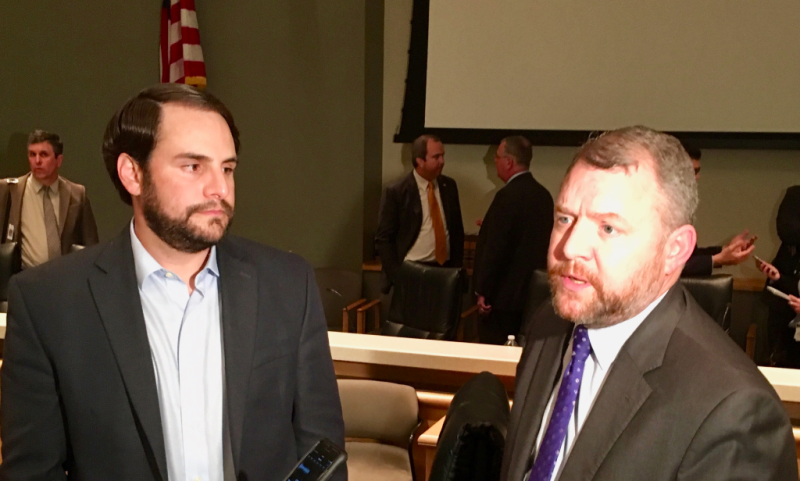 Pollack remarked: The committee could feel safe there, in a building connected to the Capitol, because the Legislature doesn’t allow anyone other than law enforcement officers to carry guns in the building and shuffles everyone through metal detectors on the way in. Schachter approached the podium with his own father, who stood next to him and rubbed his back while he spoke. A new amendment came up. It had to do with the so-called “marshal" program, which would allow some teachers or other school staff members to carry guns, if they wanted to and had received training. The Parkland parents were against that. But they were willing to swallow it, in order to get the rest of the bill — mainly some money to tear down the building where the shooting took place and rebuild, and some funding for mental health services. Plus, they didn't think arming teachers would ever happen in Broward County. The bill included a two-tier system of checks and balances: the sheriff and the superintendent both had to be on board in order for it to go forward. They felt comfortable their local leaders would keep it from becoming their reality. The new amendment by Rep. Shevrin Jones would guarantee teachers get paid 30 percent more if they agree to carry guns, acting as armed law enforcement officers in the case of an assailant attack. Jones, a Broward County Democrat, didn't want the “marshal" program to happen at all. But he assumed it would go through, so he was hoping to make it better for teachers. Annie decided she really wanted to speak right then. The chair asked if anyone else wanted to give testimony, and she raised her hand. She walked to the podium and fiddled with the microphone, trying to bring it down to her mouth. She gave up and started talking, at first, nervously. Kodish took video on her phone so she could send it to Elyse, who had left for the meeting with Scott. “Um, my name is Annabel Claprood. 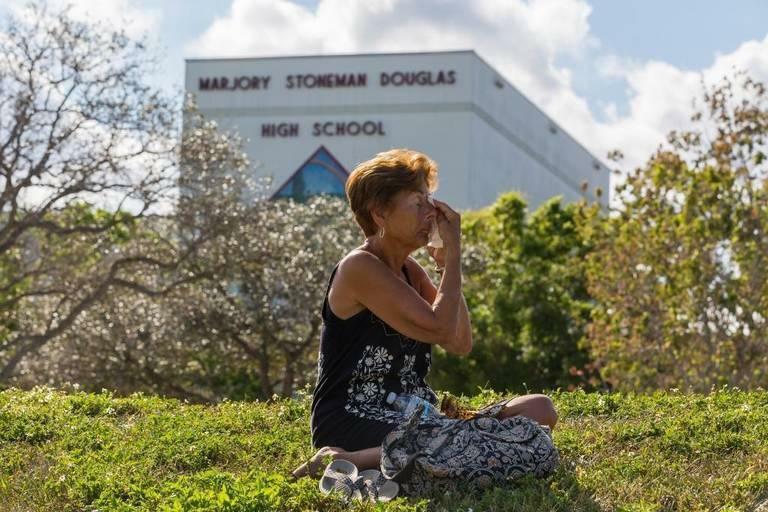 I go to Marjory Stoneman Douglas, and I was in the mass shooting in the freshman building,” she said. Annie had a speech prepared — she had been writing and revising it in the notes app on her phone all morning — but that was for when she got to address the committee on the overall bill. At this moment, she was speaking spontaneously — winging it. Her argument was more nuanced, though. She went on to say, she didn't think she wanted guns in her school at all. But she knew some teachers who want to be armed, who think they could better protect themselves and their students with a weapon. She knew others who didn't think they could handle it, who just wanted to teach. So she thought, at the very least, the program shouldn’t be mandatory. Trujillo assured her it would be optional and thanked her. “Okay. Okay,” she whispered to herself as she came back to her seat, trying to calm down. She said she felt good. Marjory Stoneman Douglas High School sophomore Annabel Claprood and her mom, Elyse, pose in front of a fountain with a statue of leaping dolphins outside the Capitol in Tallahassee. Elyse returned from her meeting with the governor. She whispered to us that it went “amazing." She said later, Scott assured the parents there was plenty of money available to address the school's needs. It calmed her. The final amendments were proposed by the bill’s sponsor, Rep. Jose Oliva. He’s a Miami Lakes Republican and slated to be speaker of the House next year. He had attended a dinner with the parents the night before, and they said he reassured them the bill would stay more or less the same as it was at that point. But Oliva’s amendment would make it mandatory for sheriffs to develop training programs for teachers who want to carry guns. The parents felt like that would erode the system of checks and balances they had clung to. Under the new plan, only school boards would be able to keep guns out of teachers’ hands. Some got up to protest this, but others were having a hard time following the debate. The amendment passed. The parents talked amongst themselves, asking: What just happened? This was a turning point in their day. It was when their hope and determination started to fade, and distrust and suspicion crept in. They felt like they’d been lied to. Then the committee was finally considering the whole bill, as amended. Trujillo asked people who had already addressed the panel not to speak again, to give the Parkland group as much time as possible. Annie was disappointed. She thought she had blown her chance to deliver the speech she had prepared. Kodish encouraged her to speak again anyway. They both got in line, and after some consideration, so did Elyse. She thanked the lawmakers for putting the bill together so quickly. She started to cry. She said she wasn't happy with everything in the bill, but she wanted it to pass, as an initial step in the right direction. The committee approved the bill, advancing it for consideration by the full House. After, we walked into the hallway, and Elyse asked: Did I sound psycho? At the same time, I said no, and Annie said yes. We laughed. I asked them how they felt about what just happened, about speaking. Annie said she knew how to keep a handle on her emotions, but she let them show on purpose when she was talking to the committee, because she wanted them to see she was scared. She said they looked like they were, too. 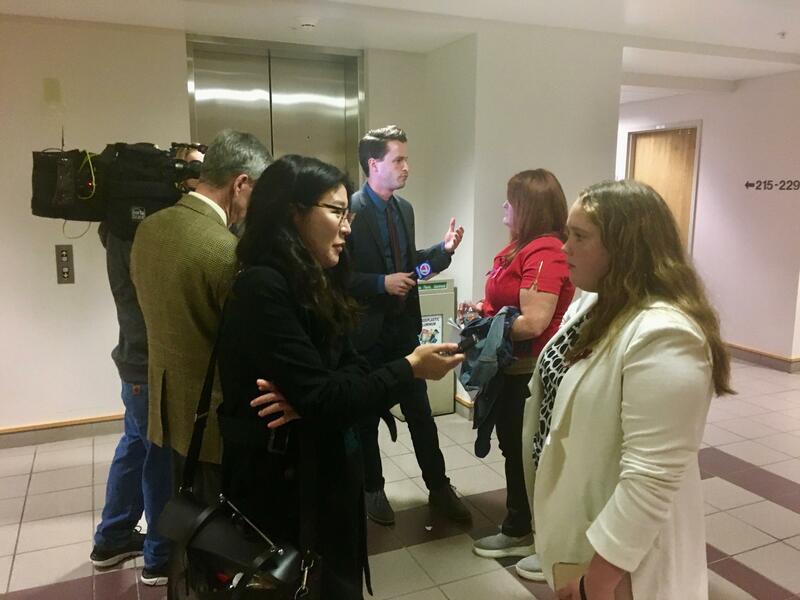 Reporters interview Elyse Claprood and her daughter, Annabel, after they speak at a House appropriations committee in Tallahassee last week. I became Elyse and Annabel’s Capitol tour guide, as they struggled to find their way to the cafeteria in the basement. There were boxed lunches waiting for the group: sandwiches, chips and cookies. At one point, Elyse told Annie she had food in her hair, pulled the morsel out and then asked her if she wanted to eat it. They giggled. As we ate, Annie told me she planned to go back to school on Thursday. (The first day back was Wednesday, but she and Elyse would be on the long bus ride back home.) She planned to take a long look around when she got to campus. “I’m going to test all my theories," she said. She wanted to feel sure the police officers who were going to be stationed on campus would be guarding the spots where students know they can jump a fence or find an unlocked door, she said. "I am going to walk around the school and see where I could have gotten in," she said, "and I’m going to videotape the whole thing." She also had an idea for how to secure the school and others in Broward County. She felt determined to tell Superintendent Robert Runcie about it. She wouldn't tell me what it was until she’s had the chance to talk to him. “I’m not at liberty to say at this time,” she said. She believed she was going to be in a meeting later that day that Runcie would join by phone. Someone came up to the table and asked if the group wanted to meet with Sen. Gary Farmer. He’s a Democrat from Fort Lauderdale who has helped organize gun control rallies since the shooting. Sen. Gary Farmer, a Fort Lauderdale Democrat. Farmer was the only lawmaker who allowed me to sit in on his meeting with the parents — one other Democrat and several Republicans asked me to wait outside. So I heard the senator’s political advice to the group: Hold out. The parents had been scared the bill might not get approved at all. They repeatedly testified in committee they didn’t like all of it but they thought it was a good start, and implored lawmakers to pass it. Gently, Farmer said they were playing it all wrong. In his view, the GOP majority had committed publicly to the bill and couldn’t back down. So he believed the parents were definitely going to get the parts they liked. But right then, they had the leverage to fight for more: Getting rid of the “marshal” program altogether. Banning assault weapons. Whatever they decided was most important to them. “This is the bare minimum,” Farmer told them, gathered on couches and chairs in his office, as he sat facing them, perched on the front of his desk. Some of the parents were nodding in agreement, but others were skeptical. They said they were afraid nothing would pass at all. He said Republicans were capitalizing on their fear. He said this wouldn’t be a first step — it would be the only gun bill Republicans would do. And when they came back for next year’s session, there would no longer be the same pressure for change. To demonstrate his emotional investment in their cause, Farmer read aloud an excerpt from an letter he had received from a woman who said her friend was the grandmother of a Stoneman Douglas student. I wasn’t able to verify the woman’s identity or that her account was true — Farmer said the letter was a private communication, therefore not a public record, and he declined to provide her name and contact information. The handwritten letter painted a picture of a disturbing scenario from the perspective of a student hiding in a classroom during the shooting, similar to many of the stories students have shared widely in recent days. While reading, Farmer paused to catch his breath and had to choke back tears. After he finished, he said: “I’m in this fight with you guys. We’re not … we’re not gonna let nothing pass. The parents were upset after the meeting. One said she felt sick. They huddled in the hallway and asked me to give them some space. They were grappling with whether to be more aggressive or stick to their original plan. They hated that they had to be making those calculations when, as they saw it, their children’s lives were at risk. Their disillusionment deepened. They didn’t know who they should trust. House speaker-designate Jose Oliva, a Miami Lakes Republican, addresses reporters during a recent news conference about a gun safety bill. Later in the day, the parents met with Oliva. I wasn’t allowed in. Here’s what Elyse said happened: They told him they weren’t happy about the amendment that changed the “marshal” program so it was mandatory for sheriffs to participate. He told them he was trying to appease some people who didn’t support the bill without that change. Despite Farmer’s certitude that some version of the gun control bill would pass, it became clear that the bill might actually be in trouble in the House. Rep. Jared Moskowitz, a Democrat who represents Parkland and went to Stoneman Douglas, was mad, too. We talked in an elevator as he led Elyse and Annie to one of their meetings. At one point, while we were waiting in the lobby of a lawmaker’s office, Elyse told me she was worried she’d have a stroke from the stress of wondering whether the bill would pass. “They literally left that room and changed everything in the middle of the night,” Elyse said. “So we feel distrust, confused and terrified. We’re entrusting the system to save our children, and they’re playing games." Then she covered her eyes with her hand. Annie was calm. Her mom said, maybe she didn’t understand what was happening? Annie shook her head. She understood. But she had learned through this experience when to show her emotions and when to keep them inside. Now wasn’t the right time and place to cry, she said. Later, I asked Oliva about the amendment, and whether the parents were justified in feeling misled. He said the change wasn't as big of a deal as everyone was making it out to be. Under the new version, it would still be up to school boards to opt into the "marshal" program. But since sheriffs would be compelled to participate, they would need to have training programs ready for interested teachers if at any point their local school boards decided to opt in. It was about preparedness, he said. Annabel Claprood, a sophomore at Marjory Stoneman Douglas High School, holds a candle during a vigil honoring the victims of the Feb. 14 shooting at the Capitol in Tallahassee last week. 'A FEW WINS FOR PARKLAND'? Meanwhile, Annie was on her quest to talk to Runcie, the district superintendent, about her secret school safety idea. But it appeared she was mistaken about the meeting she thought she was going to have with him that afternoon. She later talked to a school district employee, who wondered, were there other students who wanted to speak with the superintendent about this, too? She said, no. "I’m standing alone." Her mom gave me a look that was part impressed, part fearful. Later, a spokeswoman for the district said Runcie would try his best to meet with students or families, but she couldn’t guarantee any individual student would get to talk to him. Annie ended up talking with Moskowitz’s staff about the issue. She emerged from their meeting with some information about how the school would be protected going forward. She was told there would be 50 uniformed police officers on campus and 50 more undercover for the first two weeks back. After that, there would be fewer officers as time went on. Students would be required to have their IDs on them. “For the most part, Stoneman Douglas will be one of the safest campuses,” she said. I checked with the district about what she had heard. The spokeswoman said the law enforcement details were up to the Broward sheriff. His office didn’t get back to me. 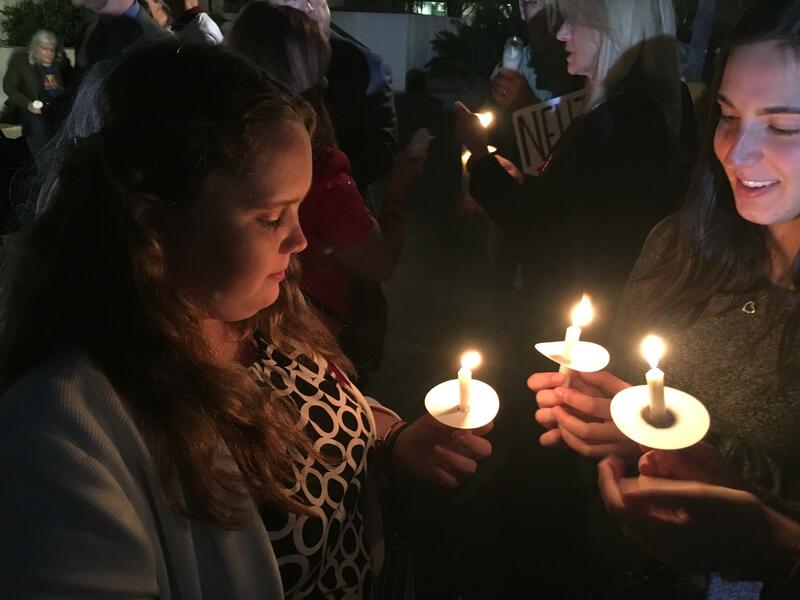 On a bus trip back to Parkland with about 50 others, Annabel and Elyse Claprood stopped outside Pulse nightclub in Orlando, where the group held a news conference calling for gun control. There were more visits with legislators and another marathon committee meeting. When their day was over, I showed them how to get to a nearby park, where a catered meal was waiting for them. As we walked, Elyse reflected on the long day. “I’m hoping we will still walk away with a few wins here for Parkland. I believe that we will,” she said. “But the process is definitely grueling and difficult to navigate when you’re a visitor. After they ate, we met up again for a candlelight vigil on the steps of the Capitol. Florida A&M University’s choir sang “This Little Light of Mine.” Elyse hugged another parent tightly, and they cried. Someone handed out candles. It was windy, and they struggled to keep them lit. The organizer asked Annie to read the name of one of the victims. She lined up with 16 others, and when it was her turn, said, “Peter Wang” into the microphone. Farmer rang a bell after each name. It was newly dark as the the vigil ended, and the parents waited for the bus that would take them back to their hotel. The next day, it would bring them home to Parkland, stopping in Orlando along the way so they could leave candles and flowers outside Pulse. Elyse said she came to bring the message: The adults failed the children, and they needed to do something to fix it. She left feeling like they would definitely do something.